Valentine's Day cards, stickers, temporary tattoos and other small plastic trinkets are usually loved for an afternoon and then simply tossed into the trash. And the amount of candy consumed rivals Halloween! This year, my son and I wanted to forgo purchasing any type of Valentine's Day cards or goodies. Instead we decided to make friendship bracelets for all of his classmates and friends. We made these friendship bracelets from plastic bags and then secured them to a card made from paper, both of which slated for the recycling bin. If you have already kicked the plastic bag habit, (good for you!) you can use bread and other food bags for your bracelets, like we did. The result, a Valentine's Day worthy friendship bracelet that didn't cost a penny, has zero impact on the environment and taught my son how to braid. Follow these five fast steps to making plastic bag Valentine's Day friendship bracelets with your children. 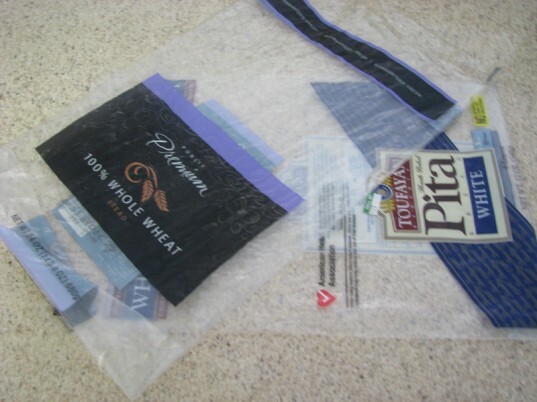 After you give the empty bags of your choice a quick rinse, you’ll need to cut each bag into strips 1-inch wide by 12-inches long. You may want to measure your child’s wrist to make sure that they will be long enough. Tie three of your strips together at one end. 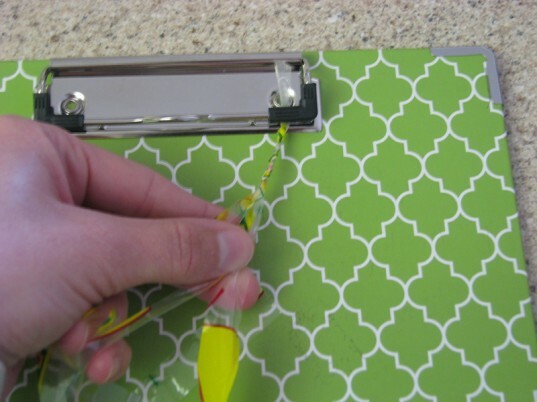 Next, clip that end underneath a clipboard clip to hold it in place while your child braids. Start braiding the bracelet until you reach the end, and then secure the bottom of the braid with another knot. We found bright colored paper from our recycling bin. Our favorites were some leftover paint swatches from a remodeling project. They added the perfect punch of color! Cut them into small squares or rectangles to include with each bracelet. 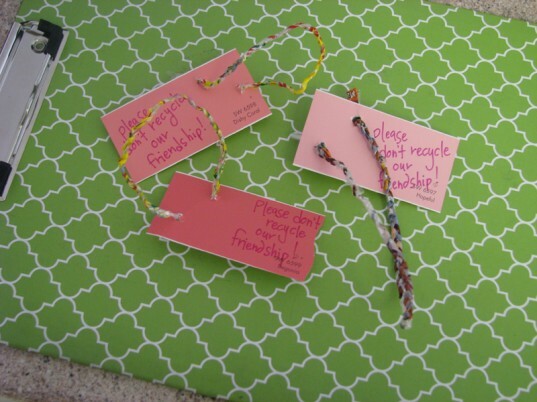 We added fun messages to the recycled paper such as; “Please, don’t “recycle” our friendship!” or “Please, don’t “re-fuse” my friendship!” Then we punched two small holes in the paper and inserted the each end of the bracelets. Now, my son has a set of recycled friendship bracelets to give to his friends and classmates this Valentine’s Day, and it only took us an afternoon to make them! This is SO smart. Can't wait to share your link with our readers! super cute and so easy...much easier really than making them the old way with yarn/thread! 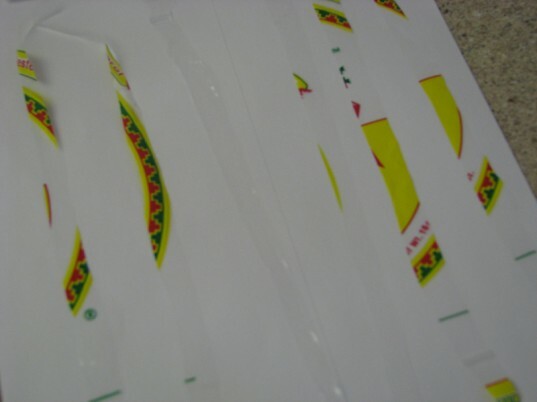 Step 2 - Get Cutting After you give the empty bags of your choice a quick rinse, you'll need to cut each bag into strips 1-inch wide by 12-inches long. You may want to measure your child's wrist to make sure that they will be long enough. Step 3 - Braid Away Tie three of your strips together at one end. Next, clip that end underneath a clipboard clip to hold it in place while your child braids. Start braiding the bracelet until you reach the end, and then secure the bottom of the braid with another knot. Step 4 - Add a Card We found bright colored paper from our recycling bin. Our favorites were some leftover paint swatches from a remodeling project. They added the perfect punch of color! Cut them into small squares or rectangles to include with each bracelet. 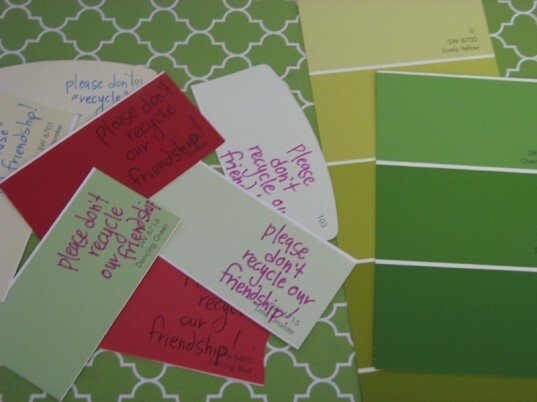 Step 5 - Add a Message We added fun messages to the recycled paper such as; "Please, don't "recycle" our friendship!" or "Please, don't "re-fuse" my friendship!" Then we punched two small holes in the paper and inserted the each end of the bracelets. Now, my son has a set of recycled friendship bracelets to give to his friends and classmates this Valentine's Day, and it only took us an afternoon to make them!